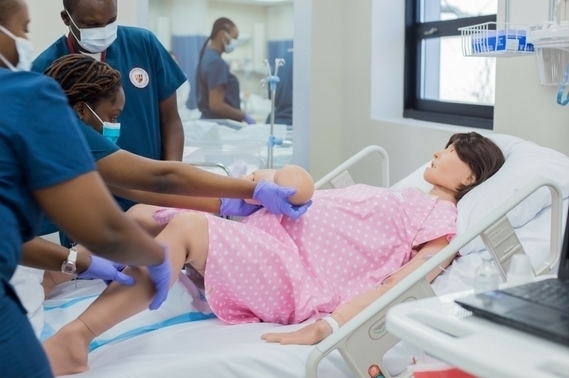 Allied health students at Eastern International College (EIC), in New Jersey, are learning important skills with the help of the CAE Lucina childbirth simulator, which provides realistic, hands-on training for childbirth scenarios ranging from normal deliveries to emergency situations. Aside from childbirth training, EIC uses Lucina to enhance general classroom learning, such as how high blood pressure can lead to complications, including heart attacks, strokes, and kidney damage. Whereas experiencing real-life medical emergencies for the first time can be daunting, if students are exposed to these scenarios in a controlled environment, it may not be as overwhelming. CAE Lucina is an excellent learning tool, says Donnelly. The simulator boosts student confidence by providing exposure to various real-world scenarios, helping students to improve their critical reasoning skills. Lucina can breathe, cry, sweat, blink -- even simulate a postpartum hemorrhage. Palpable, soft skin can simulate uterine contractions, and leg and hip articulation offer practice in childbirth positioning and related birthing maneuvers. The lifelike fetus is delivered through a realistic birthing canal and produces fetal heart sounds, cries upon delivery, and presents an umbilical cord that can be cut and clamped. Says Donnelly, "Lucina simulates real-world situations and responds to what students do in real time, just as a person would. It's really an amazing technology." Eastern International College (EIC) has been educating students in medical practices since 1990. Over the past 20 years, the school has expanded its training programs to provide a growing number of students with access to quality education for a future in the medical profession of their choice. Learn more about Eastern International College here.